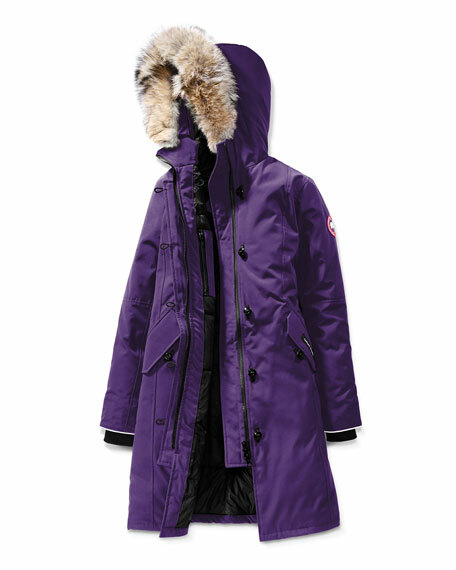 Canada Goose "Brittania" parka in signature Arctic Tech fabric. Removable hood with removable natural coyote fur (Canada/USA) trim. Storm-flap over zip front with military buttons. Gosling Graduate System allows sleeves to lengthen by 1.5" to grow with child. Recessed ribbed knit cuffs; reflective piping detail. Front fleece lined button-flap pockets. Interior zip tech pocket with wire exit; interior elasticized headphone loop. Thigh-length hem offers more protection from cold and wind. Polyester/cotton; plain-weave nylon lining; 625-fill power white duck down. Made in Canada of imported material. Moncler "Vairea" quilted puffer jacket. Hooded collar; zip front. Long sleeves; logo patch at left. Relaxed fit. Ruffle hem. Elasticized waist. Flap-snap pockets at waist. Care instruction comic at interior left. Nylon; fill: down/feather. Imported. Mr&Mrs Italy coat in washed water resistant fabric, reversible to dyed rabbit fur (China). Hooded neckline; hidden zip front. Long sleeves; snap cuffs. Hip flap detail. Logo patch at back. Relaxed fit Vented back. Polyester. Imported.